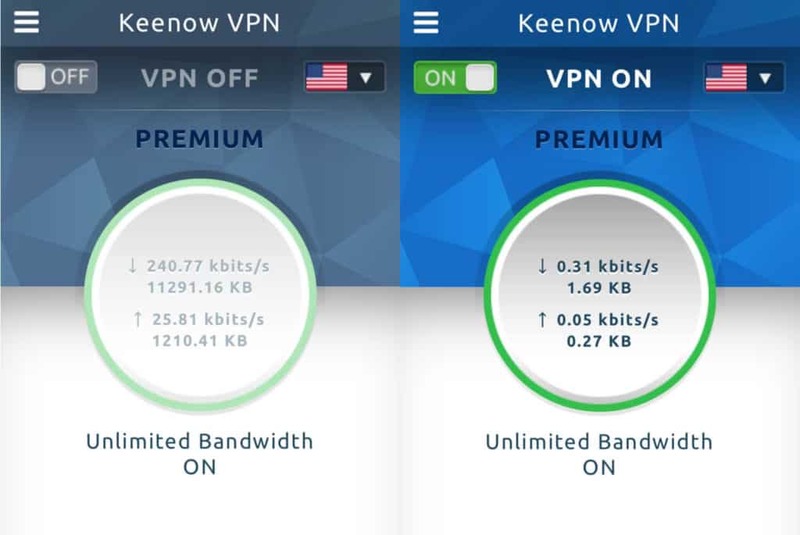 Keenow VPN Review 2019: Is it any Good? Does it work with Netflix? With a focus on streaming and offering a reliable network, this provider is ideal for those looking to unblock Netflix or torrent. Some users will be disappointed by the very small network of servers and the fact it won't work in China. Keenow is an Israeli-based company that is heavily targeted at users wanting to stream. Its major selling point is its ability to unblock streaming sites like Netflix, Hulu, and BBC iPlayer. It has a different setup to most VPN providers, with the VPN component being an optional add-on to its Smart DNS unblocker. 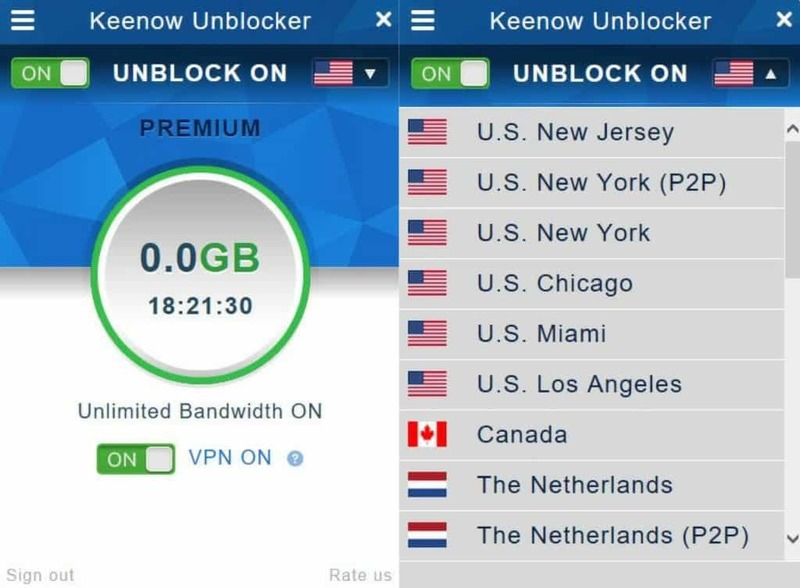 While the VPN side of things isn’t its major focus, Keenow still claims to be “The best unblocker and VPN…” for whichever country you’re in. So let’s see how it measures up! 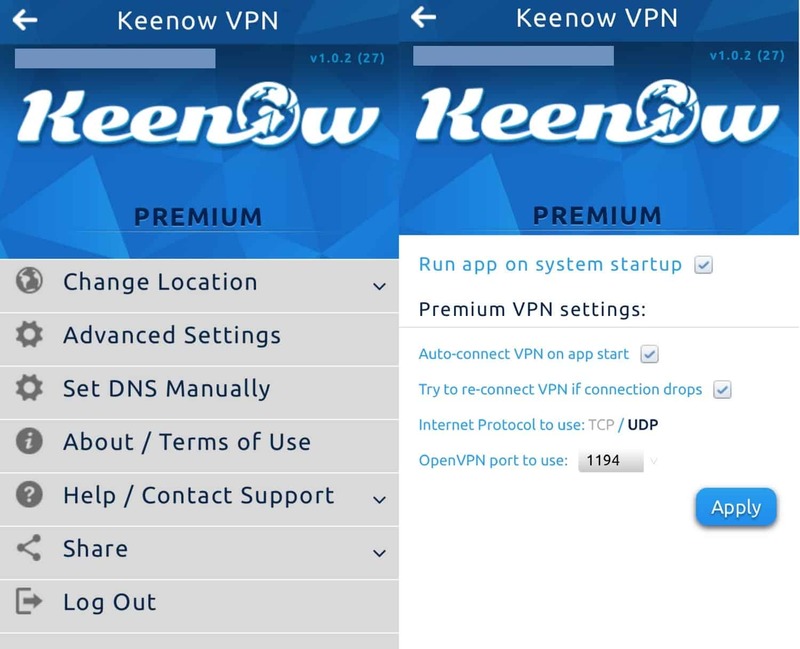 Keenow’s VPN service is part of its premium package, as an addition to its mainstay Keenow Unblocker. It has changed its plans slightly since last year and no longer offers a six month term. Instead, it advertises a free Lite package, but this doesn’t actually include the VPN. It just enables you to use the Unblocker to access US content (but there’s no Netflix access). On the VPN side, you have the option to pay annually at $5.79 (GBP £4.32) per month or monthly at $9.95 (GBP £7.43) per month. With the annual plan, you get a generous 30-day money-back guarantee, while for the monthly plan, you get seven days to get a refund. What’s more, our readers are being offered three months for free. You can pay by PayPal, Paymentwall, or CoinPayments (which includes bitcoin). Overall, pricing is pretty average when compared to other VPN providers we’ve reviewed. However, unlike other providers, there is no limit to how many devices you can use with the VPN simultaneously. With most capping at five or six, this is a great perk. As mentioned, Keenow works quite differently to other providers as its main focus is unblocking geo-restricted sites. As such, it has two components – an unblocker and a VPN service. The unblocker uses Smart DNS – a customized DNS server – to unblock streaming sites no matter where you are located. Using this method, speed isn’t compromised, at least not to the extent it is with a VPN. However, you also don’t get the security and privacy that a VPN provides. DNS proxies only tunnel your DNS traffic (website requests), while a VPN tunnels all traffic. For example, when using smart DNS, the videos you stream still go through the default unprotected network. Basically, if you’re not too concerned about concealing your online identity and your main goal is to unblock websites, then you can use the unblocker by itself. If you’re looking for more privacy, then you can connect to the VPN at the same time to offer additional security. Keenow offers unlimited bandwidth, which makes sense if its majority of users are streaming or torrenting. It has a very small network of servers compared to most providers, but uptimes are decent and the servers are very closely monitored. You can see the dedication to users in the constantly updated status pages on the website. Clients are available for Windows, MacOS, iOS, and Android. Android TV, Android APK, and Amazon Fire TV APK can all be set up as well. The iOS app is a new addition to the suite – in the past, the VPN had to be set up manually on iOS devices. Keenow also offers a virtual router that can be set up with Windows 7 or higher. 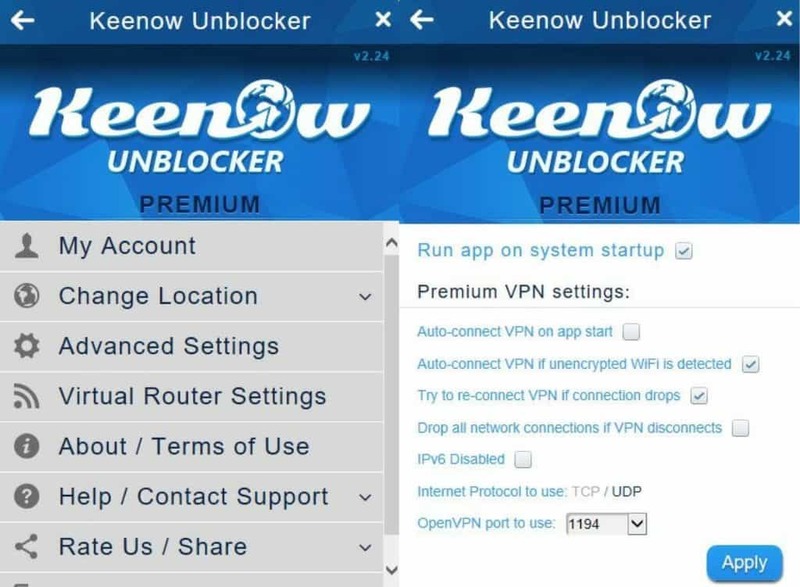 This enables you to connect to the Keenow Unblocker wifi network and create your own hotspot. Then, when you connect other devices to the network, they’ll be connected to the VPN used by the Windows device. Security is on par with many of the top VPN providers, and there are several encryption protocols to choose from. Welcome features such as a kill switch and DNS and IPv6 leak protection are all provided. If you’re looking at torrenting, there are a couple of servers (in New York and the Netherlands) that support P2P. They have unlimited bandwidth to play with and you should get decent speeds. Overall, the Keenow setup is straightforward. Just visit the Setup tab on the website, choose the appropriate download, install, and run. For the purposes of this review, we’ll be using the Windows client and the newly added iOS mobile app. Once installed and running, the desktop client will sit in your system tray and can be pinned to the taskbar. This is similar to that of many other providers and offers an intuitive, user-friendly experience. The main screen tells you how much bandwidth you’ve used and how long you’ve been connected. At the very top you’ll see an on/off slider for the unblocker, which is the Smart DNS application we mentioned earlier. Next to that is the dropdown menu for the server list, so you can easily switch locations from the main screen. For those looking to torrent, some servers are marked P2P. At the bottom of the screen, you have the VPN On/Off slider. Note that turning this on will automatically turn the unblocker on since it uses both when you use the VPN. Finally, you have the menu icon in the top left hand corner which will take you to the settings screen. The main tab to point out here is the Advanced Settings tab that gives you various setup options. Included here is the kill switch (Drop all network connections if VPN disconnects) and IPv6 leak prevention, and automatic wifi protection. You can choose your protocol and OpenVPN port. Keenow’s iOS app is a fairly new addition to the suite. In the past, the VPN had to be manually configured with iOS devices. While Keenow made the setup fairly straightforward, it was cumbersome to change servers. The new app is easy to use and makes switching between servers a breeze. The interface is very similar to that of the desktop version. In the main screen, you can see which country you’re connected to, your upload and download speeds, and data used. You can toggle off and on using the button in the upper left-hand corner and change your location by expanding the dropdown on the right-hand side. Clicking the menu icon will take you to a settings screen with a few options. First you can change the location with a similar dropdown to the one in the main screen. Then you have Advanced Settings, where you can change a couple of connection settings, and choose a protocol and port. The only other option of note here is Set DNS Manually where you can view instructions and information to help you unblock the Netflix app. Note that with the mobile app, you’ll need to enter your credentials every time to go into it. So make sure you have them handy in case you need to switch servers or make any other changes on-the-go. Keenow currently has 40+ servers in almost 30 countries, which constitutes a pretty tiny network compared with some of the larger providers. For example, ExpressVPN has over 1,500 servers and CyberGhost has more than 1,200. Other small providers like PrivateVPN cover 52 countries, offering far more choice when it comes to geolocation. You can stay up-to-date with any network issues on the Server Status page. We visited the page on various occasions, and indeed it was diligently kept up-to-date, namely concerning Netflix issues that had been fully resolved by the time of writing. You can also see how all individual servers are functioning using the Network Monitoring Status page. The small server network doesn’t appear to be a hindrance to Keenow’s functionality and we didn’t observe any connection issues while using the service. It never took more than a few seconds to connect to a server and disconnecting was typically almost instantaneous. There have been issues in this area with other providers we’ve tested, so it was nice not to have to deal with any inconveniences here. When it came to actual usage, there were no dropped connections, which isn’t surprising given the solid uptime reports coming from Keenow’s website. We streamed 1080p video seamlessly while connected to our test servers in the US East (New York) (P2P server), US West (Los Angeles), and the UK. We used the same servers to play online games and again saw no issues. We make every effort to make our speed tests as empirical as possible. We run tests four times per day at six-hour intervals while connected to a range of VPN servers (in the US, the UK, Hong Kong, Australia, and Germany). The tests are run from Canada and involve downloading a 50MB file from a US server. For each test, we record the average download speed and aggregate the data in the chart below. The first tab (Simple) shows you the median download speed for each of the providers we’ve tested. As you can see, Keenow sits round about the middle of the pack with a fairly decent median download speed. Moving on to the Detailed tab, you can see a more detailed display of the results. Here, it’s evident that Keenow has a very tight spread in results as indicated by the relatively small box size. This means it offers very reliable speeds, so you know what to expect. Note that these tests can only serve as a general indication of the performance you might see and cannot be considered definitive. The inherent volatility of the internet adds a significant factor of randomness. Additionally, you might see slower or faster or speeds depending on your connection, and smaller or larger discrepancies in results. Yes, Keenow unblocks Netflix. Keenow hangs it hats on its ability to unblock Netflix and this is indeed a major concern for its operators. Updates are constantly shown on the server status page so users are never in the dark about what’s going on. All US servers we tried with both the desktop and mobile app were working to unblock Netflix. This is a pretty big deal, since many providers can only unblock US Netflix with a handful of servers. Keenow only claims to be able to unblock the US Netflix library. Indeed we didn’t have any luck unblocking Netflix using servers outside the US, for example, in the UK and France. Netflix access is an ongoing issue for many VPN providers. Given that this is Keenow’s main selling point, you can be assured that it will always be doing everything possible to maintain this service. Keenow also offers additional instructions in case you run into issues unblocking the Netflix app while using its service. Of course, Netflix isn’t the only streaming site. We also tested several others with no issues, including accessing Amazon Prime with various test servers, and BBC iPlayer with a UK server. Does Keenow work in China? Keenow doesn’t currently work against China’s “Great Firewall”. Moreover, it’s not a priority for the company right now. Therefore, if you’re planning to travel there in the near future, you’re probably better off looking for a different provider. To sign up for the site, you’ll need to enter a valid email for which you’ll be provided a password. As mentioned, there is the option to pay with bitcoin and other cryptocurrencies through CoinPayments, which offers an additional layer of privacy. As for data security, Keenow uses OpenVPN which we deem to be ideal. There are several sets of configurations available for different ports. The most secure is AES-256 encryption which is as strong as you can expect (some providers opt for 128-bit which is still considered very secure). It uses SHA512 for authentication along with 4,096 bit RSA keys. Perfect forward secrecy is also provided as standard with OpenVPN. There is a built-in kill switch, although it’s disabled by default. To enable it, go into Advanced Settings and check the box against Kill networks connections if VPN connection drops. This will ensure that your browsing data isn’t inadvertently leaked should the VPN connection drop for whatever reason. In addition, although enabled by default, you have DNS leak and IPv6 leak protection. You have a few support options depending on your needs. The Setup tab on the website has everything you need to get started, and there is also the FAQ page, which is particularly helpful if you’re having issues with Netflix. The Support tab takes you to the server status page we mentioned earlier. This houses up-to-date server news as well as links to other helpful pages. First, there’s the Network Monitoring Status page where you can view the status of all servers. Then you have the Keenow Troubleshooting Wizard which should help you solve common issues. However, this didn’t appear to be working when we tried it out. Finally, if you still need help, you can open a support ticket. Based on the past response times we were provided with, almost half of all tickets are responded to within an hour, and the vast majority within four hours, which isn’t bad at all. However, live chat is always better. Overall, this provider offers reliable connections at okay speeds, albeit not as fast as others we’ve tested. Its undeniable focus on connecting users with Netflix means it’s a great choice for those looking to stream from that and similar sites. What’s more, unlimited bandwidth and P2P servers make it a good choice for torrenters. The fact that you can use an unlimited number of devices simultaneously is a rare bonus. Now that there’s an iOS app available, most devices can be easily set up to work with the VPN. While Keenow appears to be a pretty solid all-rounder, factors like the small network, mediocre speeds, and lack of live chat support show that is has a way to go to be able to compete with some of the larger providers.